Does the title remind you of something? The format should, and even a few names, like Rhapsody, or D Minor, or even BWV might. Does Audio Solution, Rhapsody 120 or 130 mean anything to you though? It will remind you of when you were young and you didn’t know a D Minor from a D in school. It will remind you of every audiophiles’ dream speaker, in a package so small that you simply will not believe your eyes or ears! Lastly, it will remind you of what YOU SHOULD NOT BUY, unless you are an avid believer in true unadulterated music, with no extra salt and pepper of musical trebles, insane bass, or beautiful rolled off highs. 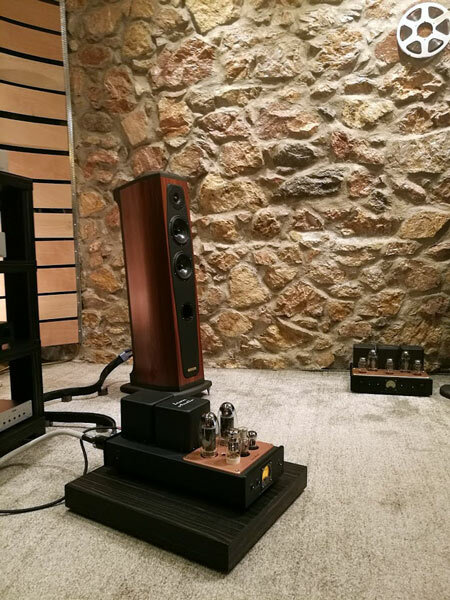 This SPEAKER IS ONLY FOR THE RIPE and SEASONED listener which has been there, seen that, and has already spent over 100.000 euro in equipment and finally understands what he wants. What it won’t remind you of, is a big name of a speaker company who has spent a few million in promotion, but rather in hard personal work, endless hours, and insane deliberation. There is no way the owner and designer of his own products got this right, without the explicit signed contract with a devil or Jesus himself! 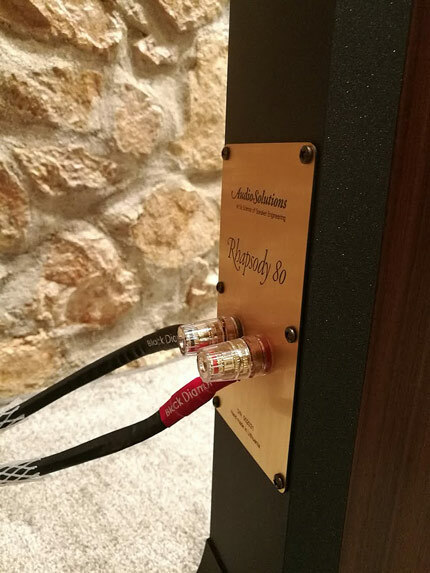 Audio Solutions Rhapsody Speakers driven by Icon Audio push-pulls (with KT150 tubes), TelluriumQ cabling loom, Antipodes Transport & Metrum Acoustics Digitals. Analog playback from Reed turntables & Shelter cartridges. 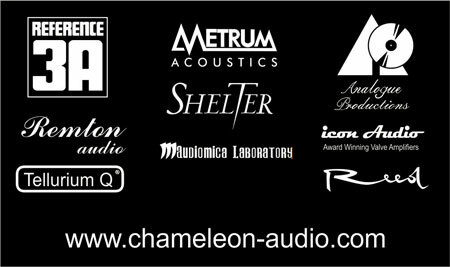 The truthful & meaningful world of Chameleon Audio ! 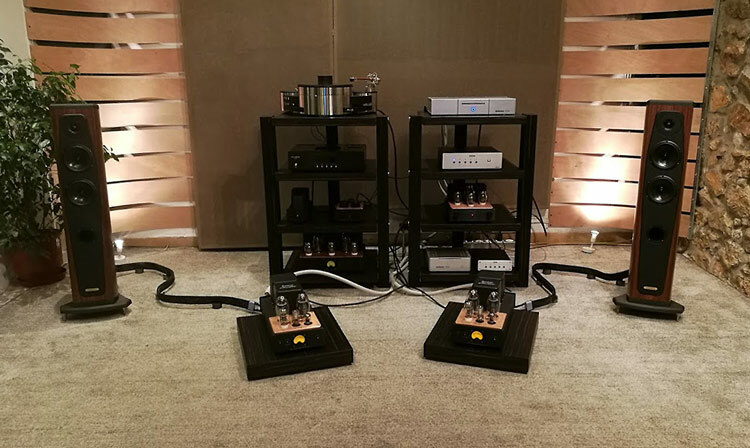 A one system set up in an audiophile’s den, (demonstration centre) is something which I have had some time to see. 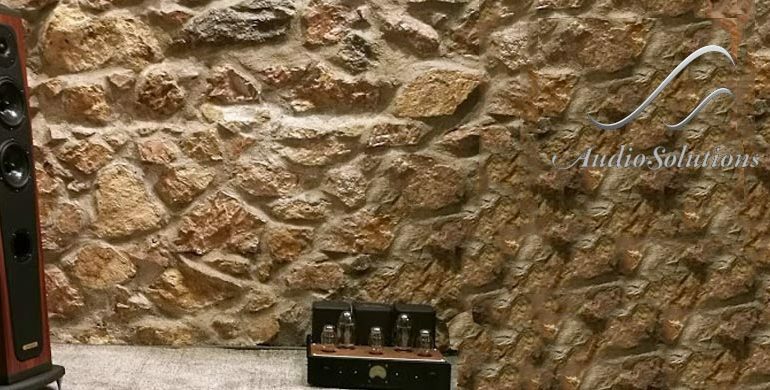 How can a professional play the smallest speaker of the range, with not over the end front end equipment, and believe he will sell? In today’s world, if you do not have a multitude of options to choose from, you have almost no chance of bringing in new clients. Of course, as you will read below, there is a reason why, and a total understanding of how it makes sense, when and only when you are so sure of your product, that is, “a take it or leave it”, or come back again when you’re ready, maturity wise. I must admit that it is a humble experience when you are invited to listen and write up a system, and yet, it is a thrill to sit down and use every single second of the past in your life’s experience, to see and hear what is subjectively (dare I say with a very strong sense of objectivity) correct, and write about it in a way as to help the reader understand the experience, and total immersion into the music you hear. So, there I was, sitting, and Nikos Kostadimas, the official representative in Greece for Audio Solutions. I felt the immediacy of terror as I heard the first 6 six notes he was about to play for me. If he does, then that is the gravest mistake I have heard in a VERY long time, and he did. He played the below piece of music for the start of my listening session. Toccata And Fugue In D Minor, BWV 565: I. Toccata by André Isoir. As I said, I simply did not want to hear it. I say this with my hand on my heart, I truly despise this piece of music. But, as I said before, I wore my objectivity hat and after being slapped for the first few bars, I swallowed the pill and listened. The volume was wrong, Niko adjusted it immediately, and from a tiny atom, a bomb hit the room! It was startling to hear the amount of space this little speaker could cover, that was the first impression I had, while trying not to show my excitement to those around me. I mean, I didn’t want to ruin my hard to please attitude. The notes where neither too big nor small, the mid band was so full, so even with the bass and so “not intruding” to the ears that I wanted it louder, and louder as my host kept on telling me to use my remote to go as high as I want to. At about 1 minute within the title, I realised the organ was in a church or concert hall and I was simply drenched in notes. The size of the room just went to the tenth larger. There it was,. played by organist Hans-André Stamm on the Trost-Organ of the Stadtkirche in Waltershausen, Germany. Just the way I can imagine Bach intended it to be, and not a thriller of blood and tales as depicted in many movies, but a sincere movement which I adored. Mind you, for the first time in my life. I stopped and pretended to read a personal message on my smart phone, but in reality, I was trying to cope with what just happened and what in the world could I say about it that would make sense? Could I speak of its neutrality and totally uncompressed sound, despite its size? Even I wouldn’t believe it. Could I talk about a philosophy which was to create a speaker that was not there to impress but to simply, give it to you in its original form with what seemed nothing between the organ, and myself. Lord, Make Me an Instrument of Thy Peace by The Turtle Creek Chorale & The Dallas Women’s Chorus, was next. This probably had a Shazam look up score of 2, (actually ZERO times played, as I just looked it up, compared to Bach’s piece just mentioned which was 84, still a shame to even compare to other pieces Bach had created). The echo of human souls, in total verse and accompaniment was evident from the first notes. Eradicated by the high crescendos and mild tenors, the performance was delightful, the presentation was clear and spaced out as to view the voices and listen to a bit of the room as well. What I could not grasp was why Niko wanted me to hear this? Why play something you know the other has nothing to do with, meaning myself with religious music. It took me some time to get it, and of course as I will disclose later, it all made sense at the end. A known performer and obviously one searched quite a lot was the next title. The female was chosen for her harsh, yet soft lows which were ever so evident here on the atom speaker dubbed the Rhapsody 120. It was not a hit, but a highly accurate separation of the instruments in time and space, slow at times, with staccato guitar strikes, a piano which sounded like a piano, and not a reproduction of a piano was evident as was Haris Alexious voice. What I did enjoy and start to very much comprehend within myself, was the no nonsense reproduction of the voice and the music. No colour, no fade, no excuses. If you recall in my introduction you will see that I wrote that those who are new to this phenomenon of finding a proper musical reproduction, will be fooled by loud drums, tiny cymbals being heard from afar, or guitar strings that are emphasized so that the weaknesses are hidden, and made into positive when we listen to our favourite music. God Must Be A Boogie Man by Joni Mitchell. Was next. The guitar immediately catches your attention as the vocals start. The imagine is sharp and between notes the spaces are dark and quiet, not a peep is coming out of this system. Near the end of this piece we have lows which catch you by surprise but in a very natural way once you understand what is happening. Now that is a title you either want to hear or to change instantly. I wanted the latter, but I couldn’t so again, so I had to listen, trusting Niko who wanted me to hear something I obviously didn’t know about. Sooner than later I felt tribal, down to my roots as they say, well this, even if you have no roots, will grow you some. The voices, and drum were so powerful and sensual that I could have gone the entire evening just listening to this. I wanted to rip off my clothes and dance in the fire which was lit within me. So powerful was the instrumentation that it was moving my head into directions I certainly didn’t plan on. Next up, but just a poetic song of drums was about to prove to me that bass can be achieved by something so small, but well calculated. As the writer Paschal Younge describes is about the best way I could sum it up, but when it came to accuracy, speed, reproduction of liveliness and feeling, he could not even imagine how this can be reproduced on something with such a footprint as small as this. Sure, it couldn’t shake the windows, but it had a way of making it sound correct, without distorting at levels of 100 dB and it did not perspire even with what should have been its enemy. Then again, who would imagine this speaker playing rock! Need I say that this went on for hours. 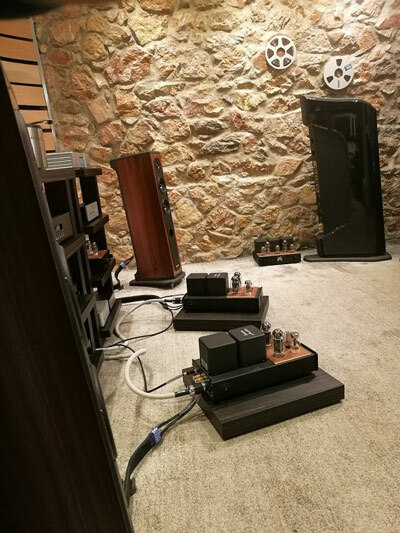 The hardest thing, I find, in the high end or Audiophile sector, is to know what you really need/want and what is correct, when you first start your journey. As we all know, a very few percentage get to the abyss of achieving this feat. This is what I meant with my intro into this article, here we have a speaker which gives a solution to the audience in a manner which is not only affordable, but very easy to be driven. Meaning, you can always upgrade your front end, meaning your amp or music playing device, and never need to change speakers. Unless of course you move to a much bigger room. I can’t wait to hear the biggest model! Here we have a speaker which gives a solution to the audience in a manner which is not only affordable, but very easy to be driven. What I did enjoy and start to very much comprehend within myself, was the no nonsense reproduction of the voice and the music. The voices and drum were so powerful and sensual that I could have gone the entire evening just listening to this. Sonically, you are set !